On top of tuition and housing, textbooks have proved to be a significant financial burden on students in recent years. According to College Board, students on average spend $1,240 annually on textbooks. “As a public university we really have to be concerned about the burden that this place is on students,” said Colin Potts, vice provost of Undergraduate Education. As vice provost, Potts is heavily involved in student quality of life and curriculum — and is the “campus champion” for Affordable Learning Georgia (ALG), an effort to increase the amount and visibility of low or no cost courses across the University System of Georgia (USG). Through the ALG program, starting in fall 2018 all USG institutions are required to “prominently designate” no-cost or low-cost course sections “at the point of registration.” All classes with course materials that total to less than $40 are designated low-cost. For example, students at Tech can use the “Advance Search” feature in OSCAR and can search for no or low cost courses under “Attribute Type.” While only 42 course sections under ten different majors were listed in fall 2018, almost 600 course sections have been listed as no- or low-cost in spring 2019. Switching to a framework of low and no cost classes encourages professors to become less reliant on textbooks. Potts draws his views on textbooks from his education in Great Britain, where students were expected to find textbooks independently to expand their knowledge. He believes commonly-held beliefs on textbook usage “deserve scrutiny,” and is actively looking for solutions to reduce costs. “We can use fewer of them where they’re not necessary,” Potts said. Abdul-Hamid Zureick, professor of Structural Engineering in the School of Civil and Environmental Engineering, currently teaches Structural Steel Design, an undergraduate course that is completely cost-free. Instead of textbooks, Zureick uses public domain articles and resources from the library to teach the class. “So far, it’s working really fine,” he said. Zureick was inspired to take on the challenge of a no-cost class when his daughter began attending college, and he realized how expensive textbooks were. The biggest challenge Zureick faces with his low cost class is the amount of time it takes. “It requires a lot of detailed drawing which takes quite a bit of time,” he said. However, Zureick believes that with the help of the Institute, more professors across campus will be able to reduce the costs of their classes. Elizabeth Holdsworth, the STEM librarian at Tech, fully supports the addition of low cost designations. “Students need to know what they’re getting into,” she said. A former low-income college student herself, Holdsworth has a personal link to issues of textbook affordability. Holdsworth, currently the library coordinator for Affordable Learning Georgia, is passionate about the issue of affordable textbooks. “It should not cost that much to do your homework. That’s ridiculous,” she said. To address the problem, the Tech Library Services provides access to multiple databases and information sources to students and faculty. “We subscribe to something like a million e-books and journals that can be reused for course materials,” Holdsworth said, who is reaching out to faculty to show them the course materials andbenefits the library has available. “Unlike physical books, the content we have access to can be used by many people at the same time,” Holdsworth said. However, Tech cannot make lasting changes to costs of textbooks until the Institute finishes gathering data on costs. “We need to know what is happening with textbooks,” Holdsworth said. Tech has currently gathered about a year’s worth of data on costs of textbooks, and will soon begin to discuss change. “With having that mandate, we’re working towards getting some better data,” said Teresa Snow, senior academic professional in the School of Biological Sciences. “Once we actually get that information in a more organized and complete way, we can see that okay, we can make better deals on textbooks here, and the library can cover materials for these classes,” Holdsworth said. 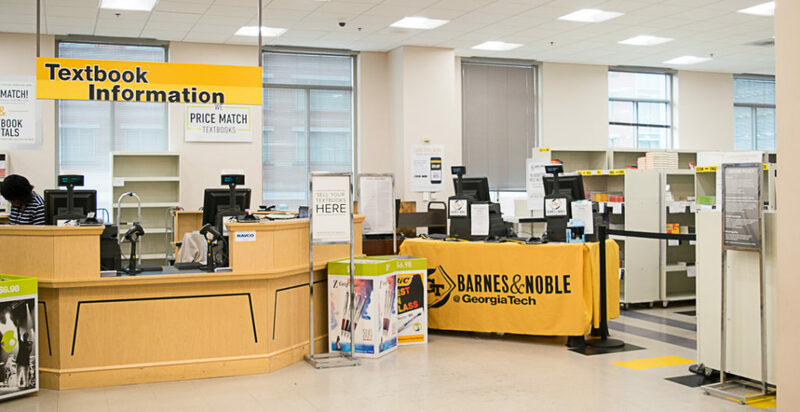 The Barnes & Noble bookstore will price match books to Amazon to try to reduce costs and also offer rental textbooks. But some worry that rental textbooks may not provide long term benefit. Holdsworth believes that students should be able to rent textbooks if it is a better financial decision for them. “I think it’s a totally fine option. I think it’s important for the student to make that decision themselves,” she said. Above all, Holdsworth and Snow believe the most important thing students can do to address the issue is to voice their concerns. “Students need to make their voice heard and their concerns. We need input from them to make our solutions as well. If it works for them, we know it’s going to help,” Snow said. Holdsworth encourages any student to contact her via email with concerns and feedback surrounding textbooks. “The more feedback you can give your faculty, the more feedback you can give me personally about your experiences with textbooks, your concerns, your challenges, the better,” she said. Although it may seem like a complex and daunting issue, textbook costs can be greatly reduced. “As long as we understand the pros and cons, we can come up with a solution for all of Georgia Tech,” Zureick said.